What distinguishes a good event from an “Oh my goodness! You should have been there! Best event ever!” event? Here’s the simple answer: The way the attendees feel when it’s over. Customer Experience (CX) is our topic of the month, and the meetings and events industry is no stranger to this concept. From selecting the right speaker to coordinating all of the magical logistics, meeting planners and their teams know firsthand what it takes to create a customer experience that matters. Every time someone walked into my great-grandmother’s house, she would offer them something to eat. In addition to a variety of hearty foods that were readily available, she always kept an assortment of old-fashioned candies, nuts, and sweets on a table in her living room. The massive selection was arranged in glass bowls atop lace doilies – a buffet that my brother and I frequently visited. Good food nourishes the soul and connects people – and it’s the same at meetings and events. If your event includes a meal, give people plenty of time to eat and connect. Offer plenty of energy breaks, water, and snacks to keep your attendees refreshed and refueled throughout the day. The days of bagels and donuts might be over, though. With emerging eating trends, diet restrictions, and healthier food preferences on the rise, how can meeting planners accommodate everyone’s needs? “Two in three people worldwide now maintain at least one food restriction. Meeting planners may benefit from understanding emerging eating trends which include food allergies, ‘clean foods’, plant-based eating, and diets like Ketogenic and Mediterranean,” said Dr. Steven Tan, a physician co-founder of Selectivor, a digital health platform that helps people lead healthier lives through food. New, innovative resources such as Selectivor can be used to organize event attendee eating preferences, share them with others, and find common foods everyone will enjoy. This platform makes it easy to see what specific foods are okay for more than 100 diets, including all of the most popular ones. With roughly 2,000,000 events occurring annually in the United States, creating a unique experience for your attendees is essential for a memorable experience. Jay Baer literally wrote the book on creating a customer experience worth talking about. His book and keynote program Talk Triggers teaches that “when you offer a differentiated, talkable customer experience, it compels conversation. And when customers talk, they recruit new customers…for free.” Jay’s widely known for his own talk triggers and just created arguably the best one yet: DressJayBaer.com. That’s right, folks – now clients can actually choose the fun suit Jay will wear to their event! If your attendees are laughing while they’re learning, they retain more information. I recently had a meeting planner refer to our work as “edutainment”. The bar has been raised for meeting planners and speakers alike, as attendees want the combo platter of inspiration, entertainment, and new ideas to implement immediately. Colette Carlson keeps attendees engaged with her hilarious, customized skit around “a day in the life” of each attendee. Filled with props that represent their daily challenges and stressors, Colette has audience members rolling-on-the-floor-laughing – while she also teaches them real-world techniques to manage it all. Creativity keynote speaker Scott Shellstrom invites attendees to be part a fun, improv comedy routine that encourages them to spark innovative dialogue, break down barriers, and ignite creative solutions. 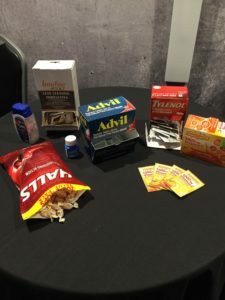 Colette Carlson shared this photo from a recent event where the event team set up a grab-and-go table of comfort items attendees might need throughout the conference. We’d love to know your favorite event examples of a memorable customer experience at a meeting or event! Leave a comment below or contact us to share it!